Becoming a Close to my Heart Consultant was one of the best decisions I ever made! I would love for you to join my team, but before you do, I am sure you have lots of questions. Below you will find some of the most frequently asked questions about signing up with Close to my Heart. Or if you are ready to sign up now, click here for the online application. April sign up special! When you join my team and become a Close To My Heart Consultant in April, you will receive the Zoe Paper Packet for FREE. In addition to questions about me and my team, I have also been asked a lot questions about the requirements of being a Close to my Heart Consultant and why someone should sign up. If you’d like to know a little more about me and my team, feel free to check out my post here. If you’d like to know why you should sign up to become a CTMH Consultant, hopefully these frequently asked questions will help. How much does the New Consultant Kit cost? The New Consultant Kit is $75 (plus tax and shipping) and is valued at over $200, plus you get a $50 Select Product Credit to apply towards your first order. PLUS, during April 2019, you will also receive the Zoe Paper Packet for FREE! What comes in the New Consultant Kit? You get a ton of great products and business items in the kit to help you get started right away. You can see exactly what is in the kit below. Is there an opportunity for new Consultants to earn free products? Absolutely! With the “Straight to the Top” program and a little extra incentive from me, you can earn tons of free products! There are three levels of the Straight to the Top program and you earn free goodies at each level. If you reach all three levels (a total of $1,200 in orders in your first 90 days), you will get (3) exclusive business builder stamp sets, a cute “On the Go” Bag, a CTMH t-shirt, and a bonus bundle of $150 in goodies... and a free Workshop Kit as a special gift from me. 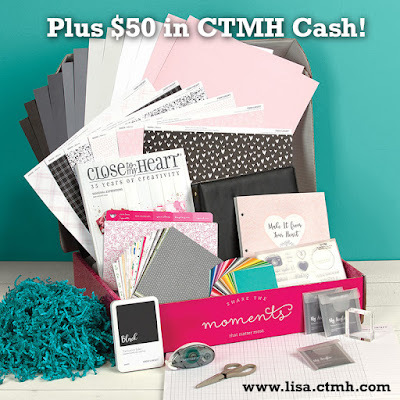 Plus, you will have earned a minimum of $260 in commission and a minimum of $75 in CTMH Cash which can be used to get more CTMH goodies. (See photo below for more info.) PLUS, as a Consultant, you are allowed to be your own hostess, so you can earn hostess rewards on top of all of the commission and extra CTMH Cash. Other than getting a ton of wonderful products at a great deal and most likely getting addicted to them, there is no catch. You have the opportunity to build a business if you choose, but you don’t have to. What if I don’t want to build a business and I just want to get the discount for myself on future orders? That’s great! Many Consultants are Hobbyists or Personal Use Consultants and do not do parties or hold classes or workshops. You are welcome to simply enjoy the discount on your own orders. Active Consultants enjoy a discount of 22%-35% depending on their sales for the month in addition to earning up to $75 in FREE product credit (CTMH Cash) each month. Senior Directors and above also earn an additional 5% - 15% of personal override commission ON TOP of the regular commission and free product credit! Your earning potential is unlimited! What are the sales requirements? The sales requirement is $300 retail (before your discount) per calendar quarter to stay an active Consultant. What if I don’t place $300 in a quarter or place any orders at all? Once you sign up, you have a full quarter to make your sales minimum which means that if you sign up today, you have until the end of September 2019 to enjoy the full discount if you choose. Then if you do not have a total of $300 in orders from July - September, you will drop down to Preferred Member status where your discount would drop to 10%. As a Preferred Member you would need to have $100 in orders during the quarter and if that did not happen, on January 1st you would no longer be a Consultant. Nope. Everything is yours to keep! No strings attached. Are you required to maintain an inventory? Nope. There are so many different products that CTMH actually suggests that you do not maintain an inventory. You can place an order for 1 item or 1000 items, so there is really no need to keep an inventory. Yes! 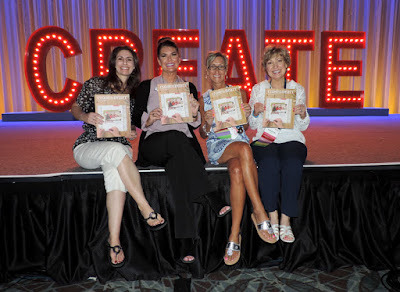 CTMH pays for the hostess rewards. And as a Consultant, you are welcome to be your own Hostess and earn more free goodies! Does CTMH offer any training or events? Absolutely! There are so many different training options available including lots of great videos and webinars. There is an entire listening library of recorded conference calls, bulletin boards for artwork, business, templates, Swaps, and Mentoring, and lots of Corporate Facebook Groups with tons of inspiration and ongoing training. They have pre-designed projects and workshops for us to use. There are annual events such as Local “Seasonal Expressions Launch” Events, Crop Weekends, Business Builder events, and Convention. There is even an 800# that you can call if you have questions. And a ton more! You will never be without help. PLUS, I offer all of my monthly project guides to my team members for free so they can use them for classes with their own customers. How much is it to have a website? All Consultants now have FREE websites, so your friends and customers can place orders online, 24 hours a day! Can Consultants send out newsletters? You bet! CTMH also provides all Consultants with free, professionally designed monthly newsletters, making it easier than ever to communicate with your customers. Can you tell me a little more about you and your team? Absolutely. Click here to read all about me, my family, and my Close to my Heart business. You can sign up at my website here. It will take you less than 5 minutes and your New Consultant Kit will be sent out to you right away. They typically ship in 1-2 days of receiving your online application. You will receive a Fed Ex tracking number so that you can track your package and know exactly when it will arrive. Of course. I am available to my team via phone, email, or Facebook. I am more than happy to help you get started building a business, or just encourage you if you would simply like to be a Personal Use Consultant. Whatever your reason for signing up, there really is no risk! You have nothing to lose! Feel free to contact me if you have any other questions. I’d be more than happy to chat with you. Whether you love creativity, community, business, or all three, you are welcome here! Or if you are ready to sign up now, you can find the online application here. What is in the new Consultant Kit? For only $75, the New Consultant Kit includes the basic business supplies you need to start your journey! Along with your kit you will receive $50 in Select Product Credit you can use to purchase the creative supplies of your choice! Join my team and become a Close To My Heart Consultant in April, and you will receive the Zoe Paper Packet for FREE! 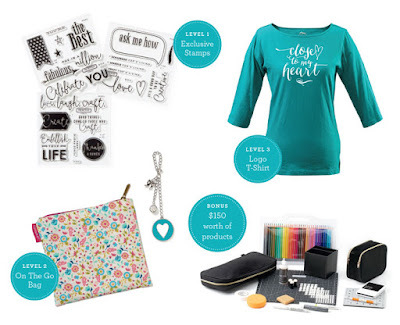 Products shown represent the contents of New Consultant Kits ordered between April 1, 2019 – July 31, 2019. Some products may not be shown. Contents are subject to change without notice, and change regularly based on product and collateral availability. Price excludes shipping, handling, and taxes. PLUS, earn these great items by participating in our Straight to the Top Program! Are you ready to sign up? Click here for the online application. Feel free to email me at lisa@lisascreativecorner.com if you have more questions or if you'd like to chat more about signing up. I'd be happy to answer any questions you might still have. So is it better to sign up July 1st? Because it might be hard to earn $300 in sales before the end of the month. Or did I misunderstand? with all this do you also get the free circut set that you offered which brought me to your blog ? Hi Genia. This month the sign up promotion is the 4 free Stamps of the Month and the discounted sign up option for those who were Consultants in the past. The last Cricut promotion that was offered was in August of last year. Sorry about that.